3. The Accumulation of Senescent Cells? Loss of structure and function in aging. Figures represent percentage of a given function remaining in an average 75-year-old man compared with that found in an average 30-year-old man, the latter value taken as 100%. Aging is the progressive loss of physiological functions that increases the probability of death. This table gives some data. show far fewer signs of aging. In the natural world, very few animals live long enough to show signs of aging. kills off most animals long before they begin to show signs of aging. Even for humans, aging has only become common in recent decades. In 1900, a newborn child in the U.S. could look forward to an average life expectancy of only 47 years. Infectious diseases were the major causes of death, killing most people before they reached an age when aging set in. Is there a limit to our maximum lifespan? I think so. While life expectancy continues to rise, it is doing so more slowly. And there has been no increase in maximum lifespan; only more people approaching it. I expect that even the healthiest people will live no longer than ~120 years (the best documented record so far is 122 years). Just as we will never see the 100-meter dash run in 3 seconds, so we are unlikely to see anyone surviving much beyond 120 years. The graph at right shows four representative survival curves. The vertical axis represents the fraction of survivors at each age (on the horizontal axis). have long life spans if they can survive environmental hazards (giant tortoises are known to have reached 177 years of age). These animals are cold-blooded and grow so slowly that they will probably succumb to environmental hazards before they stop growing and begin to show signs of aging. The situation is different for birds and mammals. They are warm-blooded, grow rapidly to adult size and, if protected from environmental hazards, will show signs of aging. Single genes have been found that increase life span in Drosophila, C. elegans, and mice. Genes that suppress signaling by insulin and insulin-like growth factor-1 (Igf-1) increase life span in these animals. 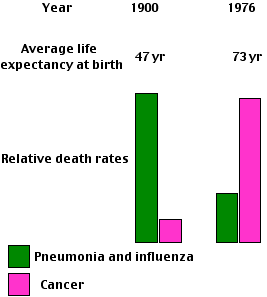 High early mortality from external causes (e.g. predators) has been linked to early aging (in the survivors) in some animals, but the reverse has been found in others. These contradictory results do not negate the role of genes in aging, but indicate that other environmental factors (e.g. more food left for the survivors) may skew the outcome. The effects of Calorie Restriction (CR). 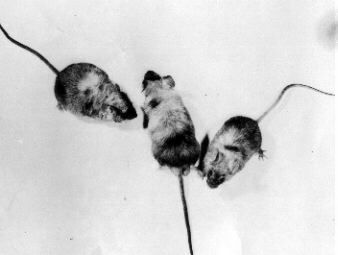 The life span of yeast, C. elegans, Drosophila, birds, and mammals (mice, rats, and probably monkeys) can be extended, and signs of aging delayed, if they are maintained on a semi-starvation diet. Why should calorie restriction delay aging? because it lowers the level of glucose in the blood and thus the speed with which lipids and proteins suffer from glycation. Advanced glycation end products (AGEs) are molecules that have reduced function because of the haphazard addition of sugars to them. For proteins like collagens and elastin, this results is increasing stiffness of the extracellular matrix (ECM) of blood vessels, joints, heart, kidney, etc. Reducing calorie intake reduces female fecundity (at least in C. elegans, Drosophila, rats and mice). The energy that would have been devoted to producing offspring can be devoted instead to tissue repair and maintenance. 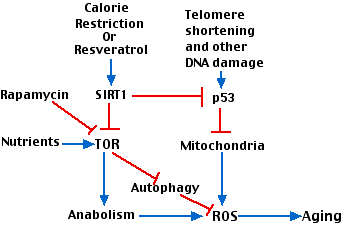 SIRT1 also inhibits p53 activation thus protecting against mitochondrial damage [View]. CR in knockout mice lacking SIRT1 gain no increase in life span. Link to discussion of reactive oxygen species. and probably most important of all, DNA. The accumulation of protein aggregates in striated muscles reduces muscle strength. Protein aggregates accumulate more slowly in the cells of animals on a calorie restricted diet — perhaps as a result of more-efficient autophagy. The DNA of the mitochondria (mtDNA) may be at special risk. ROS are produced as an inevitable byproduct of electron transport in the mitochondria [Link] and thus are generated close to the mtDNA. But the products of these genes are essential for electron transport [Link]. So perhaps a positive feedback loop is generated: ROS -> mutations in electron transport genes reducing their efficiency -> more ROS production. 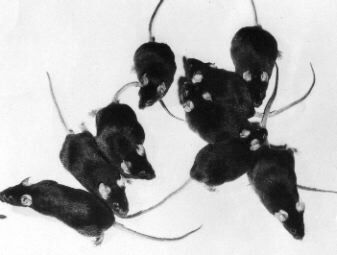 Once formed, some cells in a mouse or human are never replaced. A neuron formed during embryonic development may still be functioning at the end of life. However, during its life span, damage to its organelles and DNA [Link] may accumulate resulting in a loss of function. This is called chronological senescence. In other tissues, e.g., blood and epithelia, new cells replace old ones throughout life. But even though new, they may have reduced function because of replicative senescence. One might expect that cells removed from a mouse or human and placed in tissue culture could be cultured indefinitely, but that is not the case. When human fibroblasts, for example, are placed in culture, they proliferate at first, but eventually a time comes when their rate of mitosis slows and finally stops. The cells continue to live for a while, but cannot pass from G1 to the S phase of the cell cycle. This phenomenon is called replicative senescence. Fibroblasts taken from a young human pass through some 60–80 doublings before they reach replicative senescence. Cells — unless they retain the enzyme telomerase — lose DNA from the tips of their chromosomes (telomeres) with each cell division. In general, the telomeres in the cells of old animals are much shorter than those in young animals. A recent study of short-lived versus long-lived birds showed that telomere shortening was faster in the short-lived species. And one species, a petrel which lives four times as long as other birds of its size, actually has telomeres that grew longer with age. Most somatic cells of the body cease to express telomerase. However, cells genetically manipulated to express telomerase long after they should have stopped, avoid replicative senescence. Germline cells, e.g., spermatogonia, and some stem cells continue to express the enzyme. Some 95% of cancer cells express telomerase. If telomeres get too short (less than 13 repeats in human cells), chromosome abnormalities — a hallmark of cancer — occur. Cancer can be avoided if the cell senses this dangerous condition and ceases to divide. So telomere shortening may protect against cancer at the price of cell senescence. play pivotal roles in stopping the cell cycle. The result: replicative senescence. So replicative senescence may be the price we pay for removing cells from the cell cycle before they can accumulate the mutations that would turn them into cancer cells. The role of telomerase deficiency in mammalian aging. Mice whose genes for telomerase have been "knocked out" (either Tert−/− or Terc −/− [Link]) show many of the degenerative changes associated with aging. efforts to prevent cancer (e.g., by increasing the activity of tumor suppressor genes) may hasten aging. However, other evidence paints a less-gloomy picture. Mice heterozygous for the p53 tumor suppressor gene (p53+/−) develop many cancers when exposed to ionizing radiation. With only a single copy of this tumor suppressor, a single cell is at great risk of losing the remaining copy ("loss of heterozygosity") and starting the growth of a malignant clone. However, if before being irradiated the mice are given resveratrol — to stimulate the production of the anti-aging SIRT1 protein — the incidence of some cancers is reduced and the mice live longer before succumbing to their tumors. Effect of radiation on aging. A group of Harvard researchers reported (in the 26 June 2004 issue of Nature) the results of their study of gene expression in the human brain. They extracted the RNA from autopsied brain tissue of 30 people who had died at ages ranging from 26 to 106. They analyzed the RNA with DNA chips looking for the level of activity of some 11,000 different genes (the transcriptome). A clear pattern emerged. producing large numbers of offspring that can soon live independently. produce small numbers of young that must be cared for over a long period. Link to a discussion of r-strategists and K-strategists. Small wonder, then, that evolution in humans (and other long-lived mammals) has selected for genes promoting efficient DNA repair. the enzyme designated TOR ("target of rapamycin"). TOR is a kinase that participates in many metabolic pathways in the cell. (It is inhibited by the antibiotic rapamycin that is used as an immunosuppressant [Link]). The inefficient electron transport chain in damaged mitochondria produces ROS [Link]. Agents that increase unrepaired damage to DNA, including chromosomal damage (e.g., aneuploidy), hasten aging (as shown above). The chromosomes of aged cells have shorter telomeres than those of young cells (see above). did not have the distinction between germline (immortal) and soma (mortal) [Link] that multicellular organisms have. Asymmetric division in stem cells. Stem cells are cells that divide asymmetrically to produce a daughter cell that goes on to differentiate and a daughter cell that remains a stem cell [More]. A number of examples have been found — in Drosophila and in mammals — where aging stem cells preferentially deposit their damaged cellular components, e.g. aggregated proteins, in the daughter that will go on to differentiate while keeping undamaged components in the daughter that will remain a stem cell. So like yeast, these stem cells have a mechanism that preferentially protects the "immortal" cell from the inevitable effects of aging. These changes constitute aging and end in the death of the plant. Biennials follow the same pattern, but take two years to do it. 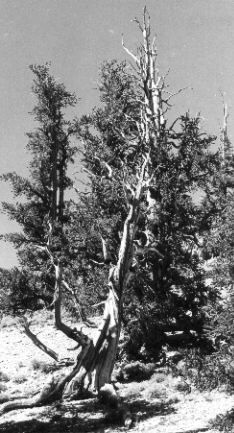 Even so, how have long-lived plants like these avoided the accumulation — over years of DNA replication as their cells divided — of deleterious mutations that would reduce fitness and life span? Perhaps it is because the cells in plant meristems, where all growth begins [View] are stem cells which divide slowly and like all stem cells, asymmetrically; that is, producing one daughter that will remain a stem cell and one that will begin a phase of rapid mitosis and eventually differentiate into the mature tissues of the plant. If (and this is as yet only a speculation) the division of a meristematic stem cell is asymmetric with respect to the segregation of DNA strands; that is, the stem cell retains the immortal strands of DNA while the cell destined to produce more tissues receives the newly-replicated strands, this would provide an additional mechanism to protect the genome as the years go by.